My Little Addiction – Would I Wear it in Paris? Mostly I use it to look at, and re-pin, nice images. I stay away from memes, thinsperation nonsense, and Disney princess stuff. But I do use it for some handy and organizational purposes. I have “Patterns I own” board where I pin the sewing patterns I, well, own. Also, I just made a “FABLE” board. 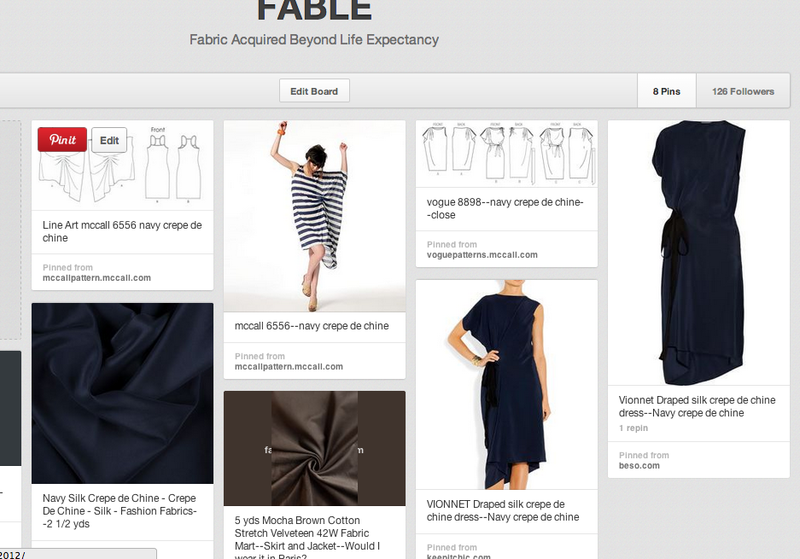 FABLE= Fabric Acquired Beyond Life Expectancy. I am not actually there yet, but I’m on my way. There are also SABLE and BABLE, but those are other blog posts. I will sometimes put comments to note what fabric I have used with one of my patterns or try to plan a sewing project. It would be handier to use this way if you could move and re-order the images on a board–maybe someday. There are other sites more useful for this and one day I may migrate some of my stuff. but for now, Pinterest. Ugh.